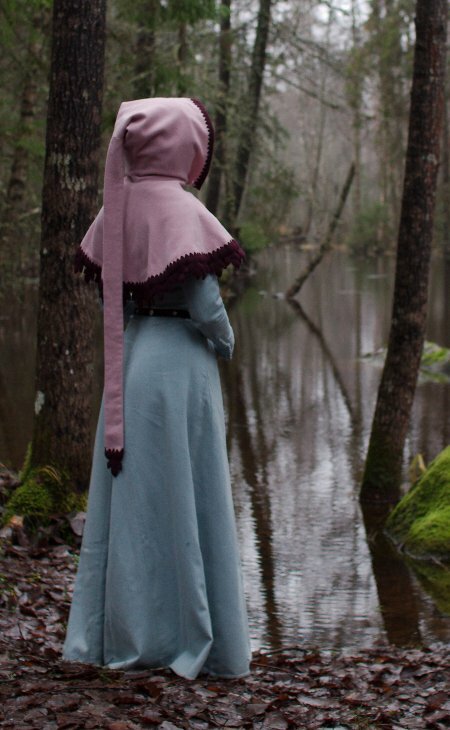 Hood was an essential 14th century accessory. It's both warm and very cute. After having worn my friend Hanna's (also known as Joanne Pekantytär in SCA) hood I decided to make one of my own for the next event. I copied the pattern from Hanna's hood. The cape was a bit tight for me at the shoulders so I added gores on the sides. I found a mauve wool blend from my stash. I had originally planned to make a coat of it but as the coat had not materialised yet I decided it was high time to use it for something else. It also looked very pretty with my light blue kirtle. I also found a small piece of wine colored wool which would be just enough for decoration. I considered lining the hood with the same mauve wool blend, but then I found a beautiful, wonderfuly soft cream colored cashmere wool. 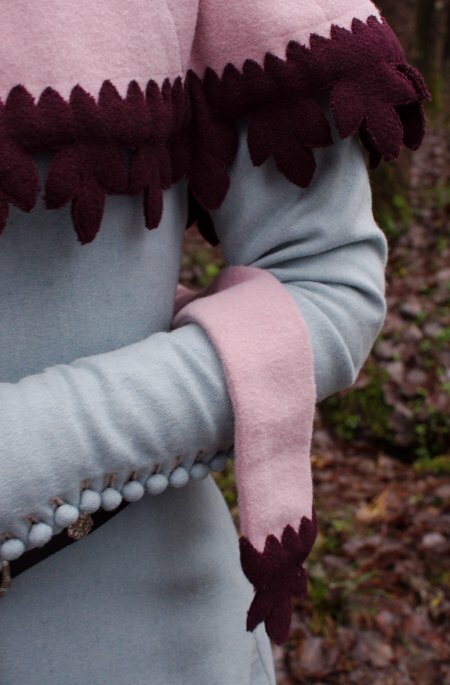 It was of course costly, and it felt kinda silly to hide the most luxorious material of the garment in the lining, but then again it would make the hood warmer than the loosely wowen mauve blend. I sewed the seams by machine and bag lined the front edges of the cape. On the edges of the hood and cape I basted the top material and lining together as they would be covered by the decorative edging. The shoulder gores I had added had changed the shape of the cape slightly, so I had to shorten it a bit at the shoulders so it would not look too heavy. I decided to decorate the hood with a leaf-shaped border, very fashionable at the period. I marked the shape of the edge on a doubled strip of wool with chalk, stitched the pattern with short machine stitch and then trimmed away the extra material very closely. 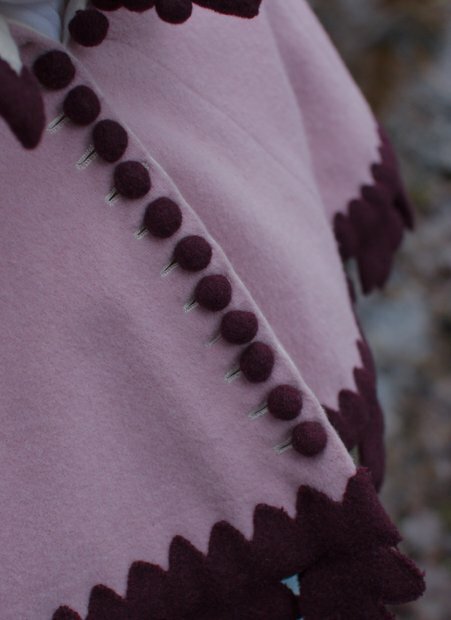 Or course the period method would have been to either just cut the edge to shape or finish it with blanket stitch. For the first option the wool was too loosely wowen while the second was more time consuming than I was prepared to give for this project. The finishing I used looks okay anyway since the machine stitching doesn't show much on the dark colored fluffy wool, time will show how it will take wear. I can always take it off if it begins to ravel too much. The leafs are far from even, as the chalk wouldn't stay very well on the fluffy surface, but it doesn't show that much either unless you take a very close look. The decoration on the end of the liripe is quite off, but I didn't have energy at the moment to do it again. This was one of my less perfectionistic, relaxing projects. I shaped the right side of the upper edge of the leaf border and simply turned under the wrong side. Sewing the shaped edge was surprisingly fast since the stitches dissappeared so well on the fluffy surface, so I didn't have to make them very small and neat. I edged the front edge of the hood with similarly shaped border. I made the buttonholes with cream colored silk thread, this time using just blanked stitch which was faster to make than buttonhole stitch. I made cloth buttons of the remains of the wine colored wool. The hood was small enough to be carried in a bag, so apart from the few machine sewn seams it was another nice public transport / coffee break project. The hood turned out very cute and warm, a nice, practical garment that is wonderful on chilly evenings. 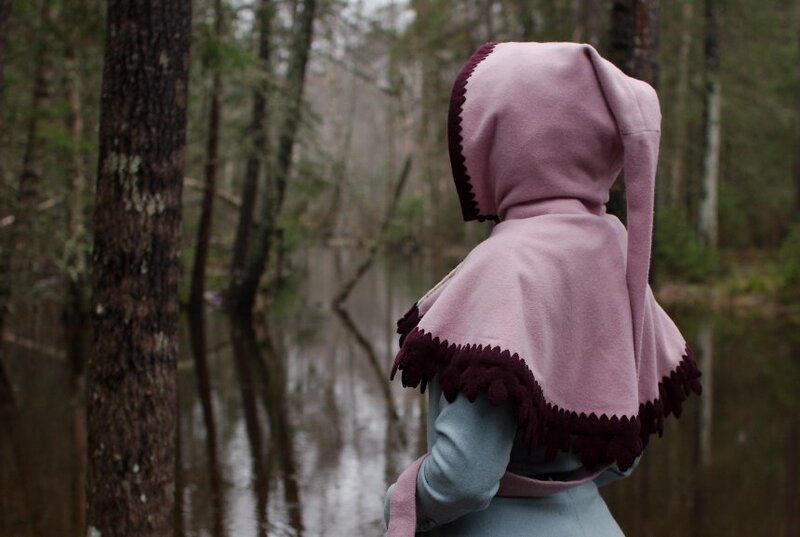 Since making this I read my Thursfield more thoroughly and learned that this style of hoods were mainly worn by men, while women wore smaller hoods open at the front. Nevertheless I like this hood so much that I'm going to continue using it anyway. Special thanks for Hanna for the pattern!